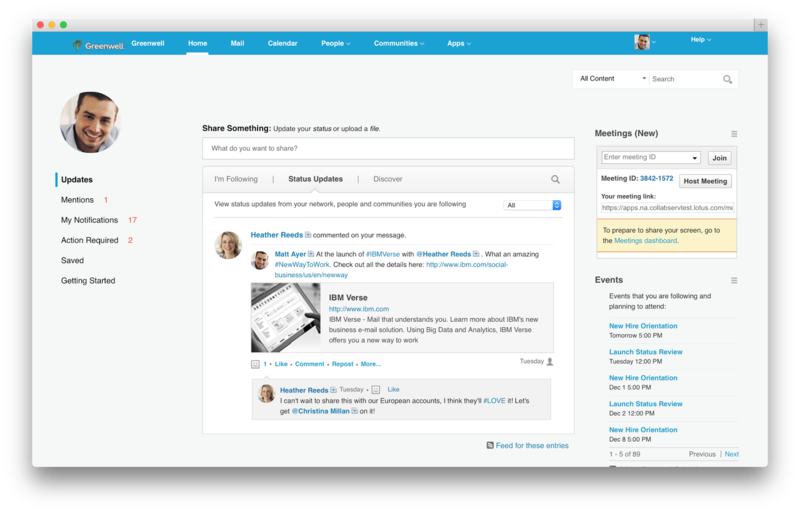 Over the weekend, IBM rolled out new features to IBM Connections Social Cloud, the market-leading enterprise social collaboration platform. In this month's release (if you are wondering, we'll skip updates in December because of the holidays so the next release will be in January), you'll find capabilities that the community has been asking for in the IBM Connections ideation area. With the announcement of #IBMVerse last week, we've enabled a new theme to match the visuals found in that product. Admins can choose to use this new theme. We'll keep updating this one, though don't hesitate to let us know what you think about this one. For the entire list of what's new (including in the chat, messaging, and meetings components), check out the latest What's New in IBM Connections Cloud documentation. While #IBMVerse 's ability to drive a #NewWayToWork has taken the spotlight this week, there's more goodies to talk about today. First, we are in the midst of rolling out some cool new features to our cloud. Next, very soon we'll publish the IBM Connections Desktop Plug-In for Microsoft Windows to streamline the install experience for cloud users. 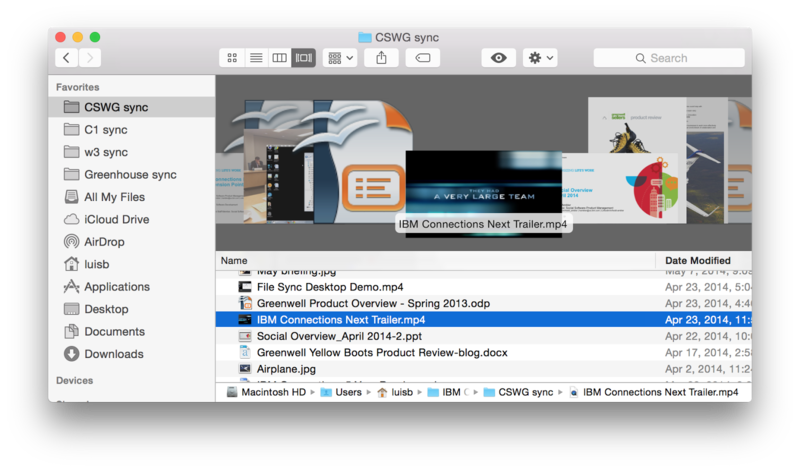 Additionally, IBM Connections Content Manager (CCM) users can now do round-trip editing. This means that while they are browsing for files in a Library, users can click on "Edit" in the browser and the file will open with the user's favorite local editor. For example, a Word document, will be opened with the desktop app of Office 365. When the user is done editing, they simply close the local app and the file is then automatically saved and uploaded back to server. The plugins are now available in the app catalog and you can download them at no additional cost from the links above. Earlier this year, I had the opportunity to be part of the unveiling of IBM Mail Next at IBM Connect 2014. Now it's time to get your hands on it! Below is a copy of the webcast invite so you can check out the latest details on how to be an early adopter and all the latest integration into IBM Connections, IBM's market-leading enterprise social collaboration platform. See you there! Every day, emails flood our inbox: tasks are left undone, messages go unanswered, and meetings overwhelm us. Why does work have to be such hard work? The truth is, it doesn’t have to be. Join our live video panel discussion on Thursday, November 20, 2014 at 11:00 AM ET and hear how IBM’s latest solution offers an easy way to take back control of your day. Understands your needs, working style and priorities—and anticipates what you need and when you need it. VP and Principal Analyst Alan Lepofsky of Constellation Research, will discuss the critical importance of re-assessing the way we are currently working and what the future of work holds. Provides less clutter and more clarity with an interface that shows only what you need, so you can make quicker, smarter decisions. Hear Phil Gilbert, General Manager, IBM Software Group Design, explain how the IBM Design Studio developed an entirely new experience from the ground up. Enables a shift from “me” to “we” through intelligent, secure and engaging social apps that foster real-time understanding, cooperation and communication. Jeff Schick, General Manager, IBM Enterprise Social Solutions, will talk about why information from our social networks is crucial for collaboration and innovation, and why email must evolve to accommodate it. As an added bonus, watch for details on becoming part of the beta! Register now and get ready for an extreme mail makeover: re-imagined for the future of work. Register now!